This Fiber One cereal review was inspired by my father-in-law who stayed with us for two weeks. He likes to eat a mix of 4 different cereals and one of them is Fiber One. I was happy to buy him all four (corn flakes, wheat biscuits, and Cheerios were the other three) cereals and I was very interested in sampling Fiber One. 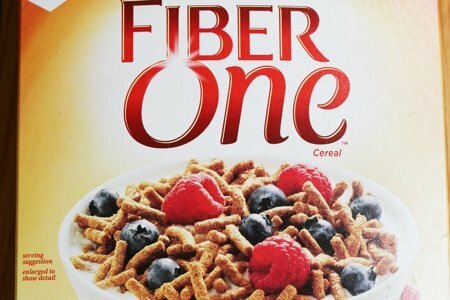 I had stayed away from it because of the name – Fiber One – which seems to indicate that it could be about “fixing” my digestive tract. My stomach is functioning well but about 42 million Americans have a problem with constipation. 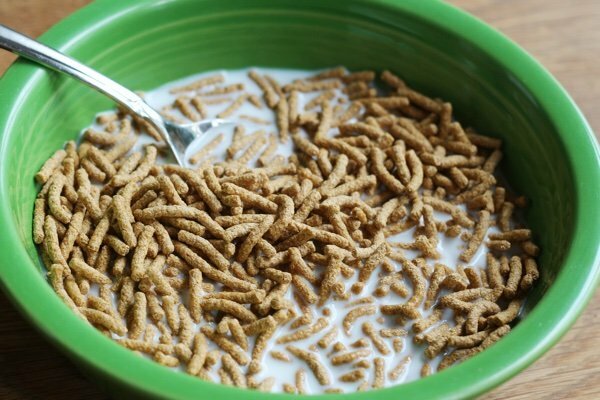 High fiber cereal is one of the foods that are recommended (along with fruits and vegetables) to help alleviate the problem. I found the look of the cereal to be strange. Do you see how it looks like little worms? I never found this cereal appealing (sorry General Mills). Is this stuff even for real? 14 grams of fiber or 55% of your daily value in 4 ounces? I can see why they call it Fiber One because this is a huge amount of fiber for such a small serving. How did they do it? Unlike Special K Nourish and Quaker Breakfast Bars, Fiber One has only zero grams of sugar. Hurray! In addition to the cereal ingredients, there are a number of vitamins and minerals added. This cereal fits all of my requirements – whole grain, less than 4 grams of sugar, more than 4 grams of fiber – but I was surprised to see “sucralose” in the list. I did taste a sweetness to the cereal but it didn’t have the bitter aftertaste that I usually sense when I eat something with sucralose in it. My husband did have the bitter aftertaste after he ate this. He said that the consistency was along the lines of cardboard and I have to agree with him. I did actually like this cereal much more than I thought I would. I’m not sure I could eat it every day. My father-in-law’s idea of mixing it in with other cereals is a good one if you need the extra fiber but can’t handle an entire bowl of it. If you don’t mind artificial sweeteners, I would recommend this as a healthy choice. The fiber may help to fill you up so you feel less hungry before lunch. Have you tried Fiber One? What do you think of it? In the summer, I mix the Fiber One with strawberries and blueberries and cottage cheese. If I can find it, I use the Fiber One cottage cheese....it's strange that is the only cottage cheese I can eat. I believe I saw this recipe long ago assocatied with South Beach Diet? I like to mix Fiber One cereal with nonfat plain yogurt and peanut butter powder. It's very filling and I get some protein in the mix. I don't eat it every day but I eat it frequently (when I don't want oatmeal). I mix fiber one into yogurt and put it back in the fridge to soften overnight, I love it this way. I use this cereal all the time. I make yogurt , mix in some cereal and add some fruit. Also I add it to a bread recipe I make with no oils or extra fats. Tastes great and it has less calories than regular bread. I LOVE Fiber One cereal, particularly for the high fiber content. I like to use it like instant oatmeal when it's chilly outside. I mix in either water or milk, then heat it in the microwave. It softens and you can then mix it up to be as "chunky" or as smooth as you'd like. I also like to mix it in with yogurt, or on top of a big salad. Also, if you like the Hungry Girl website/blog/emails/cookbooks, she uses Fiber One in a TON of recipes, from crusts, to coatings for onion rings, to baked goods. Check it out. Ha! I just finished some. I often have it for breakfast. I use 45g of Fiber One, 2tbsp of PB2, one cut up banana, and 1 cup of unsweetened vanilla almond milk. Helps keep me satisfied for quite a while. I eat Fiber One frequently, often mixed with a cup or more of puffed wheat and a cup of sliced strawberries (cut the berries in egg slicer - makes them perfect). I like the touch of sweet, and boy for unde 200 calories (with berries) I get a huge bowl of cereal that gets me through several hours and makes me feel good. Not everyone will like it, but it's a solid healthy go-to for me for over 15 years. There is a recipe for "Open-faced Blueberry Pie with Bran Crust" in Jane Brody's Good Food Book: 1 1/2 C Bran Buds (or any bran cereal), 1/4 C Flour, 2 Tbsp Butter (melted), 1/2 C Apple Juice. Combine until cereal partially softens, press into pie plate, bake 375/12 min. I like Fiber One Cereal because you can have up to 46 grams for the same amount as the 30 grams listed as a serving. It helps to fill me up. I mix it with cheerios and use it as a "breakfast on the go". I don't use milk on my cereal so this works for me. This actually usually is a lunch options some days. Great receipe for your fiber intake with a little sweet . One sleeve of Fiber One, one package 10oz of chocolate chips, you can add a tablespoon of almond or peanut butter of your choice. Melt Chocolate chips and peanut butter in a large bowl in microwave or on stove. Add sleeve of Fiber One and stir to blend all together. Line a large cookie sheet with foil or parchment paper. Drop on sheet in 1 tablespoon amounts,should make around 24, refrigerate or freeze to set up. I put them into a zip lock bag n keep in fridge for quick snacks. Many Hungry Girl recipes use this product, often crushed to use as healthy bread crumbs. Check out her website for recipes and tips. Absolutely love Fiber One Cereal! I eat either Fiber One or All Bran which doesn't have the sweet tast. I mix with a banana or the fruit of the season. One thing about either one, 1/2 cup it does fill you up. Cellulose is used as inexpensive fiber source- and is wood pulp or sawdust, if you will. Called the company - they confirmed this for me. I like to get my fiber from whole grain cereal such as Uncle Sam"s. That's the dietitian in me! When you get to be my age, you don't care if the taste is cardboard or worms if it helps you go. I ate this for many years mixed with rice pudding for breakfast to make my gastroenterologist happy and liked it, too. After a few years, it turned on me and I experienced extreme distress. I have learned that eating insoluble fiber on an empty stomach can cause stomach irritation. Also, this cereal contains aspartame which doesn't agree with me. Have made this recipe many times with fiber one. It's great! I make extra & freeze for a quick meal. Great over salad. I have had this before and general like fiber one bars a lot. It's like candy but it's good for. I like raisin bran much better though. Go figure, I like the mushy taste sort of like oatmeal. But my favorite is "overnight oatmeal " with fiber-one and fruit layered as a breakfast. It's yummy. Great on salad too. Or as a crust fir fish or chicken you might have for lunch or dinner. I love Fiber One cereal. I mix my 1/2 cup serving with berries - strawberries, blueberries, and raspberries - in the morning. I freeze my berries, so heat them up a bit in the microwave before mixing with my cereal The berries get a little juicy and I find this works great when mixing in the cereal. I've also mixed the cereal in yogurt on occasion. Very filling and gives the yogurt a nice crunch. I forgot to add this little gem: Haystacks. Delicious. I make mine without the peanut butter. They can be portioned and frozen, and if you make 24 of these per the recipe, it calculates to 4 Smart Points each. I often mix fiber one with 1-2 other less healthy cereals and I find it delicious that way, even if it is mixed with another pretty healthy cereal, like Uncle Sam's. ALso, you can make a pretty delicious fiber one "hay stack" (like a coconut haystack) by mixing it into a small amount of melted chocolate. A satisfying but semi healthy snack treat! I agree that this cereal is not that visually appealing or tasty. I love that it is such a great fiber source so I have used it frequently in my muffins. Works great!! Very similar to Fiber One is Nature's Path Smart Bran which is delicious in yogurt or cereal with fruit. I like to combine it with Nature's Path brown rice puffs too. It's very filling, healthy and good for keeping one regular. Ever since I found the NP Brand I started to enjoy cold cereal again. The normal-sounding ingredients appeal to me, still looking for the ones with little to no added sugar. Bob's Red Mill Hi-Fiber Cereal is another good cereal [hot kind] for getting fiber or to use in homemade bran muffins. I too like to put Fiber One cereal in my yogart. For a low calorie sweet treat, I mix Fiber One cereal and some Light cool whip together.Tasty! If you are in a hurry you can add the Fiber One to your cup of coffee and spoon it out. I love Fiber One with a teaspoon of cocoa powder, half a sliced banana, and almond milk! So delicious!!! Why do none of the supermarkets ever have this cereal on sale? The numbers cited are for a one-half-cup serving. I got used to the cardboard flavor and texture after about 4 bowls; after that I found Fiber One to be just right: not sweet, giving me a good grounding in fiber towards that elusive 30 grams a day. Only one bad thing: sucralose. I stopped eating it daily after I noticed that toxin in the cereal. Now I eat one bowl a week, in the evening of a day when my fiber intake has been too low. Why, General Mills? Why would you ruin a wonderful product like this with sucralose? (Hey, why not throw in some corn syrup and canola oil just to make sure it's a toxic product?) Look, GM, great product -- well done, bravo, etc, but just replace the sucralose with stevia and I'll eat a cup a day of this stuff. And so will both my parents, and my ex and probably tens of thousands of other adults who see that sucralose in the ingredients and say, "No way, too bad though... "
Thanks for the suggestion! Think I'm gonna make the switch. Can't eat Smart Bran by Nature's Path. I'm allergic to psyllium!